Google is Changing their Looks as Technology changes . Google had changed Google Search, Google Map, Google analytics Looks Google had updated their design and had given New Look. 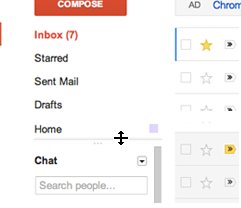 This Gmail New design make User interface easier and simpler so any user can easily compose mail and send it. Gmail is one of the most widely used product of Google and Google don’t want to loose their user just because of User Interface and are trying to give their best and i like gmail because it does not expire even if you don’t use it for long period of time. STEP1:- Login to your Gmail account . STEP2:-Go to settings and Select Themes (Mostly select HD Themes like Turf ). STEP3:-Click on your Favorite theme it will automatically get apply . Display Density where Gmail get automatically Adjusted to the resolution of screen.There are three types of Display Density Comfortable, Cozy, Compact.By default it’s Comfortable so Gmail get automatically adjusted to screen. HD Themes this had changed the gmail look with high resolution images .There are many HD themes which are powered by istockphoto. One of my Favorite theme in HD is Turf* (* indicates HD Themes). Smooth Navigation which helps to move label and chat contacts up and down . So that you can easily customize your Left navigation panel . Enjoy Using New Gmail Look.